Before learning how to draw hands: some fun facts before starting sketching! Each hand is made of 27 bones. Half of the bones in the human body are located in the hands and in the feet. About 7 to 10% of adults are left-handed. Only 75% of men and women are washing their hands in public restrooms. Learning how to draw cartoon hands can be quit difficult. Hands have a particular skeleton and they only move in specific directions. Fingers (1) do not have the same length. The middle one is the longest while the thumb is smaller and ticker. Notice the curve that separates the index from the thumb (2) and the one located below the little finger (5). The hand is composed of many irregular shapes. The fingers are made of circles and rectangles. It's important to keep a good distance between the thumb and the other fingers so that we can identified it rapidly. When we're able to see which one is the thumb, we're also able to tell if we're looking at the left or right hand and if the hand is up or down. Let's draw a hand using several circles and only one rectangle. First, draw one circle for the palm of the hand and then a rectangle for the wrist. Next, add the fingers using oval shapes. You can draw a small curve near the thumb (in red) to add more realism to your work. To make sure your cartoon hands are anatomically correct, don't forget to place the fingers in the right place (with some distance between them) to keep the two long curves along the palm intact. Now that you know how to draw good looking hands, don't forget that cartoon hands can have four (7) or even three fingers. You can draw really tick fingers (5) (8) too! Don't hesitate to use your own hand as a model. And if your right-handed and need to draw a right hand, just draw your left hand and flip the image over! 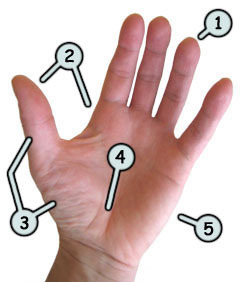 Most of my characters have hands like the number (7) below and it works pretty well!